There is a repeating wish that people would like to use the full scale of editing tools on masks, and handle them as grayscale layers. They are usually told that masks only have the alpha channel, and they are mistaken to think that values of alpha are considered shades of gray. I think this is not the full story. 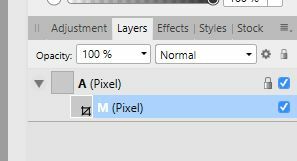 One can use a regular pixel layer as mask, and the alpha channel (transparency) of the pixel layer will be used for masking, while ignoring the RGB channels of it. 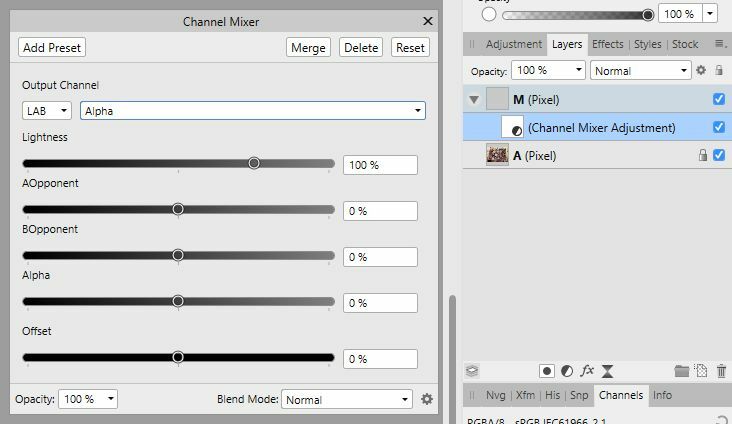 Furthermore it is possible to put a live Channel mixer adjustment on top of a pixel layer which makes it transparent based on it's luminosity. Combine these two tricks, you get a mask, where you can do every aspect of grayscale editing. Interesting looking technique that should prove useful. Thanks. Perhaps, as it already works, it should have been in Tutorials rather than Feature Requests, so more of us would see it or be able to find it easily? This thread is over my head. I found it looking for luminosity mask info. A question- what would this technique be used for exactly? I'm not clear on the meaning of gray scale editing. Is that editing black and white photos or, something to do with "white reveals, black conceals" ? Thanks for taking the time post on this technique. EDIT: Went and watched/worked with the Channels videos and I believe I'm on the same page now. The videos are found Here - Affinity Photo - Channels for Alpha Masking and Here - Affinity Photo - Channels: Greyscale Blending. If there are other learning opportunities you're aware of, please post. Add info on researching this topic.